Living with Logan: Iron Kids Review and #giveaway! Iron Kids Review and #giveaway! One of the biggest challenges of having a child, or more than one child that has extreme allergies, is making sure they get all the vitamins and nutrients their little bodies need to grow and stay healthy. For us, it's been a headache trying to find any kind of vitamin supplement Logan can have that 1)doesn't have sneaky little allergens in it like maltodextrin, or soy and 2) won't break the bank. Several months ago, I started tweeting with Deb Lowther (@KidsGummyMum), whose husband makes IronKids Gummy Vitamins. When I discovered that their gummy multivitamin was not only gluten free, but also soy, corn, dairy, and egg free, I was excited! FINALLY! A multivitamin that is fun, healthy, and Logan safe! I was lucky enough to get the chance to meet Deb in person at BlogHer this year, and speak with her over lunch about what an amazing product this will be for our family and the families of many others. We spoke about the great benefit of being gluten, corn, soy, egg, and nut free for households with children on extremely restrictive diets while adding an element of fun for a child that has never been able to eat a gummy. Following BlogHer, the Monster House got a fun package in the mail with a bottle each of gummy multis and Omega-3 gummies. The Omega-3 is the first gummy to use 100 % fish oil with no fishy aftertaste, and won Canadian Living Best New Product in 2010! In fact, IronKids is the first entire brand line to be approved by Health Canada. I love the fact that there are no artificial flavors or colors, ever. The monsters fell in love with these gummy vitamins, and actually fight over who gets to be first each morning. Because this is the first time the twinnies have been able to take any sort of vitamin, I mentioned to Mighty M the other morning how pleased I've been that the twinnies actually enjoy it, and that we need to buy more in the near future. Here's the awesome part: Mighty M said, "Yeah, and I think they're getting what their bodies are needing from 'em, because all the other monsters have been sick for like, two weeks, and the twinnies only had it for like, 12 hours. Yay vitamins!" Yes, Mighty M really does talk like that. 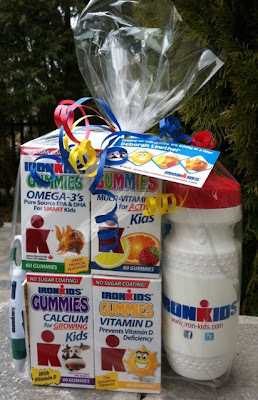 IronKids Gummy vitamins are made in Canada by Life Science Nutritionals, a growing company started in Burlington, Ontario to give kids an all natural choice in a gummy vitamin! No sugar coating, no aspartame, no artificial colors . . only real ingredients. At Life Science Nutritionals we believe that people are our greatest asset and that your health is your greatest asset. That is why we are dedicated to developing nutritional products, with uncompromised quality that benefit the health of our consumers. By formulating products based on modern science and innovative technology we deliver products with true nutritional value that help our consumers live healthier and more fulfilling lives. Because the Monster House is so impressed with our gummy vitamins, we were thrilled when Deb asked us if we'd like to host a giveaway! One lucky Monster House addict will win some gummies of their very own! If our winner lives in Canada, they will receive the prize pack as shown above. If our winner lives in the US, they will receive 2 bottles of IronKids Multi-Vitamins and 2 bottles of IronKids Omega-3's and they are awesome! images and references to IronKids, Life Science Nutritionals, IronKids Gummies are property of Life Science Nutritionals and are used here with permission. I was sent two bottles of vitamins to try and review. All opinions are my own. I was not compensated in any way! Ok! Let the fun entering begin! !